Only a few patches of snow remain in the park - welcome warmer weather! Although the temperature at the start was only a bit above freezing, it was still a nice break from the last two months. 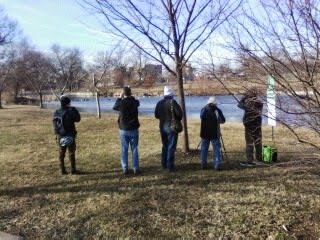 As I waited for the participants to arrive, a Yellow-bellied Sapsucker flew high into a nearby tree, Juncos bounced around the base of another tree along with some Cardinals. There were lots of Robins - some fought with their neighbors while others concentrated on securing their breakfast. 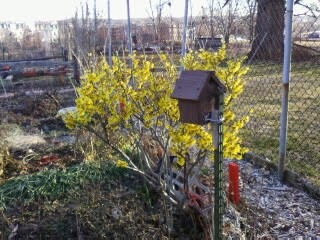 Here's one sign of spring in the community garden - blooming Witch Hazel - although I believe only non-natives bloom in the late winter. In the summer, a House Wren family usually lives in this nestbox. 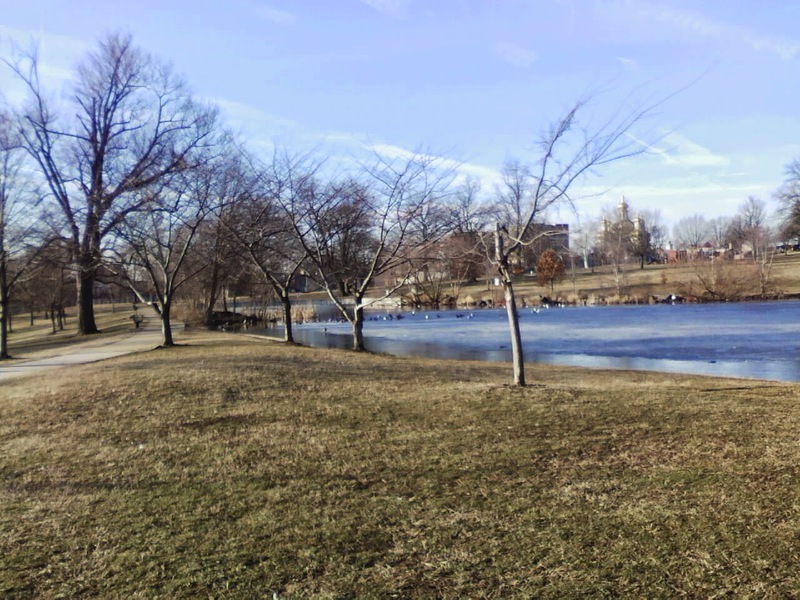 The Boat Lake still had some ice on it. Canada Geese, Mallards, the resident Muscovy Ducks, and Ring-billed Gulls were all present. There was one unlucky duck carcass frozen off the island. Here we are discussing those odd Muscovy X Mallard oddities. 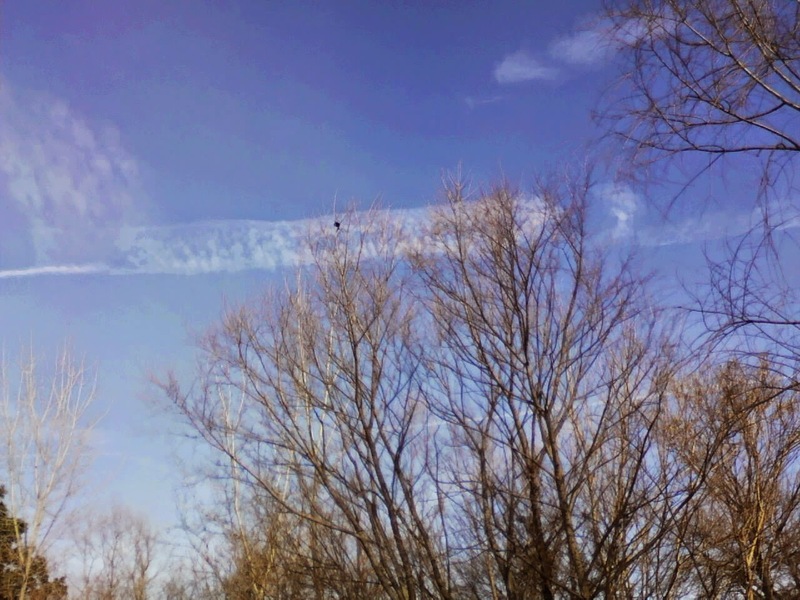 Red-winged Blackbirds were in attendance. Males separate from the females. We found one! A lovely American Woodcock resting in the grasses. Thank you Pat for lugging along your scope so we could examine it. Unfortunately digiscoping with my cell phone did not turn out very well. 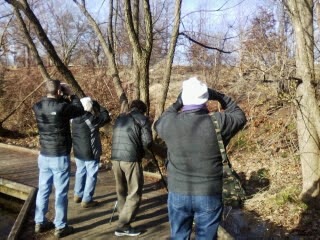 The next bird walk at Patterson Park is Saturday, March 28, let by Audubon staff. Hope to see you there!